The exposition covered 135 acres along the waterfront and featured rides, gardens, sideshows, galleries and cafes. The Hall of Progress spotlighted the progress made in the previous 100 years and provided futuristic views of Cleveland. The “Streets of the World” exhibit acquainted visitors to cultures from more than 40 countries around the world. 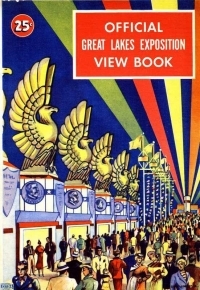 The fair drew 4 million people in 1936 and 7 million in 1937. Admission to the Feb. 21 program is free for Bay Historical Society members. Non-members are asked for a $5 donation. The main entrée of pasta is provided by the historical society. Guests with a last name beginning with A to L are asked to bring a side dish for 10 to share. Guests with last names beginning with M to Z are asked to bring an appetizer or dessert. Everyone should bring their own place setting. The social hour is at 6 p.m., with dinner at 6:30 p.m. and program at 7 p.m. Attendees are asked to R.S.V.P. to Beth Conroy at 440-821-4427 or email beth2335@yahoo.com by Feb. 18. The next Bay Village Historical Society potluck program is on May 16 when Lee Hall, fossil preparatory and lab manager with the Cleveland Museum of Natural History, will travel through time down Interstate 71. While I-71 was under construction, giant armored fish skulls and mummified sharks buried for 360 million years were uncovered. Learn the history behind the discovery of this hidden treasure.